I have a sweet tooth, and I am not ashamed to admit it. Give me cookies, and I could probably eat a dozen easily if I lacked any will power. However, I do have will power that I have developed over time and part of the reason for that is knowing what sugar actually does to my body when I ingest it. 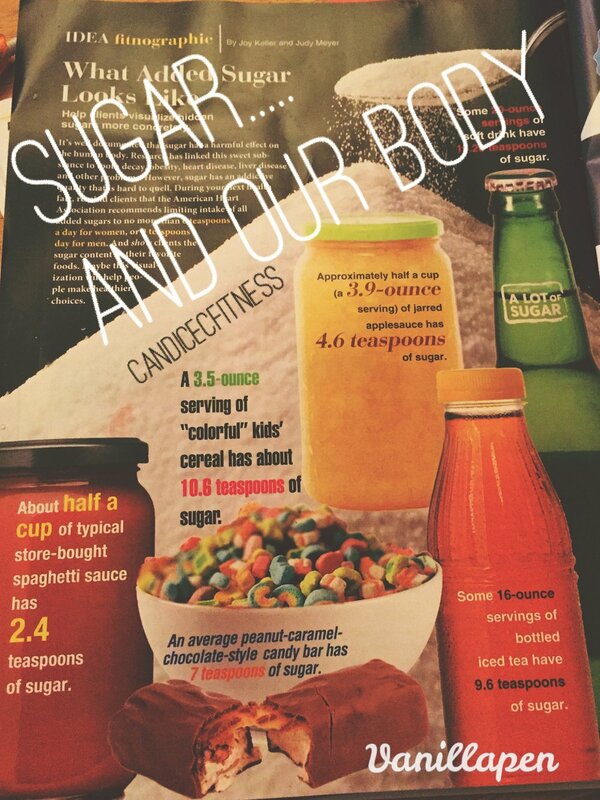 Primarily added sugars, or manufactured sugars. Moderation, again as I state all the time is the key. So what happens exactly when you eat sugar? And what is it? Sugar when eaten is broken down by your digestive enzymes into glucose and fructose. Now glucose is a form of something our body uses for energy, but too much of it can cause harmful side effects. When absorbed causes our pancreas to release insulin which in turns takes the glucose to your cells to be used as energy. However too much insulin can cause the blocking of leptin (the hunger hormone) which makes you feel hungry even though you just ate… this can also cause your body to be tricked to storing glucose as belly fat because it thinks it is in starvation mode. Too much insulin can also cause your body to not release enough dopamine over time which makes you feel good…. this leads to cravings and can cause addiction like mentality. (btw this is also what happens by the brain when you do cocaine ). Over time your bodies cells can become resistant to insulin which causes an overload of it in your blood stream which leads to different forms of diabetes. The thing is SOOOO many of processed foods contain both forms of sugar. Natural food like fruit does too but we aren't as prone to eat too much of that stuff and some sugar is not a bad thing (in its natural form) as it helps with energy. By taking measures to LOOK at food labels, and cut back on the stuff everyday that contains a lot of sugar you can really decrease your risk for so many diseases like diabetes. I am also a FIRM believer (as I have seen results first hand) that eliminating a lot of sugar from our diets improves our skin as well….. even CELLULITE. Yes cellulite. In a nutshell, this country has a very large obesity problem, and its sad to say that much of it is caused by the FAKE stuff that many manufacturers (not all) make for us to eat. They know sugar causes cravings, so if they include it in their products they not only taste better but they will get many many repeat buyers who do not know any better. Not to mention processed forms of this stuff is a lot cheaper than the natural forms. But each one of us have to power to choose what we put in our bodies. Treat them as they should be treated. Our bodies are machines and fueled right they will look and perform right, fueled wrong and they will perform like crap and look like crap. Just like you wouldn't put cheap gasoline in a Ferrari, you shouldn't put cheap stuff in your body either ;).